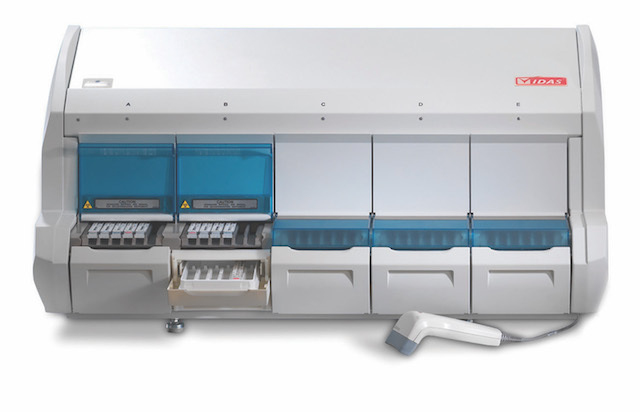 INTENDED USE: Automated test for determination of human procalcitonin (PCT) in human serum or plasma (lithium heparin) using the Enzyme-Linked Fluorescent Assay (ELFA) technique. For use in conjunction with other laboratory findings and clinical assessments to aid in the risk assessment of critically ill patients on their first day of ICU admission for progression to severe sepsis and septic shock. Prospective, randomized studies showed a significant decrease in antibiotic use for patients who had received PCT-guided therapy, without significantly affecting safety. Risks: False positive results leading to unnecessary treatment with antibiotics, False negative results leading to delay in selection of appropriate therapy.